Property rights means freedom. When someone says “I own this computer, this car and this house”, that person means he/she has exclusive right what to do with those properties. Whether to keep using them, or sell them and get a new one, or lend them to friends and relatives, or simply give them away for free to someone else. There is no external group or persons who can dictate and coerce that person what to do with those properties. 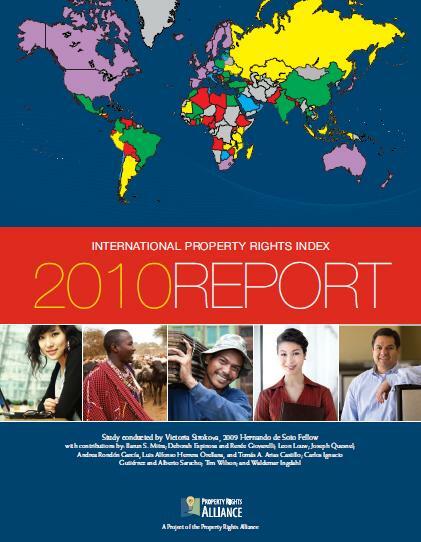 This week, IPRI 2010 Report was released by its main sponsor, the Property Rights Alliance (PRA) in the US. It is authored by Ms. Victoria Strokova, a young and dynamic intellectual from Russia who studied in the US. This time, there were 125 countries covered and the Report was co-sponsored by 63 think tanks from 40+ countries that are free market-oriented and strong believers of private property rights protection. Our very own Minimal Government Thinkers, Inc. is one of them and the only Philippine-based think tank that partnered with IPRI. The IPRI Report measures three main categories. One, the legal and political environment (LP), composed of judicial independence, rule of law, political stability and control of corruption. Two, physical property rights (PPR), composed of protection of PPR, registering property and access to loans. Three, Intellectual property rights (IPR), composed of protection of IPR, patent protection and copyright piracy. LP is important. When there is no rule of law and the government (from the Executive to Legislative and Judiciary) is corrupt, some politicians and bureaucrats can produce or allow the production, of fake land titles and they or their friends can engineer land grabbing of someone else’s property. PPR and IPR are equally important. When someone can say, “the huge cost of your scientific research and invention is your and yours alone, also the losses from your unsuccessful work. But your successful invention is also MY invention,” and government will tolerate it, then innovators will be discouraged from undertaking expensive and highly risky research and innovative work. And society will be stuck with old and outdated technologies and inventions, affecting productivity while human demands and population keep rising. There is a scoring system employed in producing the composite IPRI, 1 the lowest (meaning almost zero protection of property rights) and 10 the highest. The more important question now: how did the Philippines and other Asian countries fare compared to other countries around the world? Again, the Philippines belonged to the bottom 40 percent of the 125 countries covered by the study, 80th out of 125 countries. What pulled down the country’s overall score and ranking, is its low score in the legal and political environment (LP), only 3.5. For sure, big corruption and plunder scandals in government, plus policy reversals last year like strong attempts to re-regulate the petroleum industry and actual drug price control, contributed to the low belief by entrepreneurs and the citizens of the government’s ability to really promulgate the rule of law. Populism and leftism, the synonym concepts of socialism, will push any country towards economic underdevelopment. Private property is not public or government property. Private enterprises’ pricing should not be tinkered as government pricing. I am posting two related articles below. Decentralization and devolution of power from the national or central government to local government units (LGUs) is a favorite topic and advocacy of many LGU leaders and academics. The main reason is that LGU leaders know more about the needs and priorities of their citizens than those in the national government and in Metro Manila. In October 2008, I went to Gummersbach, Germany, to attend the international seminar on “Local Government and Civil Society”, sponsored by the Friedrich Naumann Foundation (FNF) at the Theodor Heuss Akademie. One of our readings prior to flying to Germany was a paper by a German political scientist, Dr. Monika Ballin, entitled “Local Government and Civil Society”. Two, the principle of subsidiarity applies. Responsibilities as much as possible should be done at the lowest level, and only when a responsibility exceeds the capacity of one level that the next higher level should be entrusted. Three, decentralization and privatization. Responsibilities need to be shifted from the top down, and responsibilities which are not in the national or local sphere have to be privatized. Local authorities must have their own sources of funding to assert their fiscal autonomy. The purpose of political decentralization and devolution is to shift some responsibilities from national to local governments. Unfortunately, for many countries, this did not result in greater individual freedom and citizen empowerment and self-administration, but greater power, regulation and intervention by local governments. Most LGUs got drunk with the new regulatory powers vested on them by decentralization policy. Thus, while various national government agencies have already imposed a number of taxes and fees for businesses and ordinary citizens, LGUs also created and imposed their own new set of taxes and fees. The main reason given by LGU leaders why they did so is because they also assumed more responsibilities and expenditures that used to be funded by the national government. What was overlooked by many LGU leaders and their supporters in the intelligentsia, is that the smallest unit to assume responsibility for the citizens is not the barangay or village, a political unit and is part of the entire State apparatus. Rather, it is the individual, the households, as well as their voluntary organizations – like neighborhood associations, sports clubs, civic and rotary clubs, student organizations, labor unions, and so on. Thus, if the principle of subsidiarity is to be applied strictly, then most responsibilities should fall on private individuals, parents, firms, and citizens’ voluntary organizations, not on either national government or LGUs. This is part of a transition from decentralization to privatization. And by privatization I do not mean the transfer of function from a government unit to a private corporation only. Not exactly. It can be an NGO, a cooperative, a sports and civic club, a church organization, and so on. There are certain functions that are better handled by the national government, and not by LGUs or by individuals and their voluntary organizations. This includes the promulgation of the rule of law. A law against killing applies whether the crime happened in Luzon or Visayas or Mindanao. The heavy hands of the State should run after criminals, murderers, rapists and kidnappers. Another law, the law against stealing. It should apply whether the theft is the President or a Governor or the poorest of the poor. Most social welfare functions for special cases are better handled by LGUs. Like public education for the very poor and those with physical and mental disabilities, especially if the parents are poor. A state of civil society is supposed to be higher than a state of democratic governance. And yet we see majority of civil society organizations (CSOs) and non-government organizations (NGOs) that work and behave like adjunct of the government (local, national and multilateral) and political parties. Why has this happened? There you are. A state of civil society is a state where individuals know their rights, freedom and responsibilities, as well as the freedom and responsibilities of other people. In so doing, they assume as much responsibilities as possible in managing their own lives, their households, their communities, their school and offices, their church and other voluntary organizations. It is a state of minimal government, both national and local. Now the lowest level of social, political and economic unit in any society is not the village or barangay. It is the individual. Thus, things that are better done by the individuals, their households, their villages, their sports, church and civic organizations, should be left with them. Only when certain functions they cannot deal with, say neutralizing an organized and armed gang of robbers, drug pushers, carnappers, killers and other criminals, then they pass that function to local government (barangay, city/municipality, or province). When the local governments cannot handle certain functions, then the national government should take over. An example of functions that cannot be handled efficiently by individuals and their voluntary organization, and the local governments, is maintaining an air force and navy to neutralize sophisticated, highly organized and well-armed criminal groups like sea bandits that sea-jack passenger and cargo boats. So now, why did I say that so many CSOs behave and act like adjunct of the government and political parties? Because instead of asserting individual freedom and responsibility, instead of correcting repeated government failures, such groups push for even bigger government responsibility, intervention and regulations. An outstanding example is the party-list system in the Philippines. The Constitution provided for the participation of “marginalized sectors” in the House of Representatives by allotting up to 20 percent of all seats in the House, to be occupied by party-list Congressmen/women. This provision shows that the Constitution itself doubts the sincerity of the legislative district-based Congressmen/women that they will indeed protect the interests of the “marginalized sectors”. Thus, these party-list House seats need to have their representatives there too. Distrust begets distrust. In the coming May 2010 elections, 300+ party-list groups applied, saying they are from the marginalized sectors. Wow, so many marginalized groups! Does it mean that all past legislations including budgetary appropriation by both district-based and party-list Congressmen/women were all failures in reducing the number of “marginalized sectors”? Out of the 300+, the Commission on Elections (COMELEC) authorized 187. Repeat, 187 party-list groups and voters will choose only 1. My point here is that all those party-list groups are CSOs, one way or another. Instead of pressuring existing political parties and party-lists why things remain foul, they all joined the political complexity. Include also so many CSOs that whenever certain social problems arise, their standard proposal is “more government regulation”, or “more government subsidy”, or “more taxes from the rich”, or “create a new department/bureau”, and so on. And there is the implicit pressure that they hope that the leaders of CSOs will be appointed as heads of those new offices or be appointed to replace other officials. What happens now to advancing the principle of subsidiarity, of individual freedom and responsibility? Nothing. We are all hooked to supporting the least corrupt politicians among candidates whom average voters suspect were engaged in some dirty arrangements as past government officials. CSOs should go back to their roots. Their leaders are not politicians, they are not part of political parties, they are not representatives of the corporate world. They are voluntary organizations that thrive only on voluntary support by members and private donors. Foreign aid cannot really redound to benefit its target, the poor in poor countries. This is because foreign aid is government to government. Politicians and bureaucrats of rich countries give foreign aid money to politicians and bureaucrats of poor countries, either through bilateral (like USAID, OECF, CIDA, etc.) or multilateral (like ADB and WB) arrangement. So if any of the party is corrupt, ie, the giver and/or the recipient government, then effectiveness of foreign aid is immediately reduced, if not evaporated. Notice that countries and economies that do not rely much on foreign aid are more developed: Singapore, Hong Kong, Taiwan, S. Korea, etc. It is capitalism, the desire for more and bigger profit -- by producing better quality goods and services in the face of endless competition -- that drives their people to work more, to produce more, and not rely on foreign loans on a government to government arrangement. Compare them with countries that until now keep begging for more foreign aid -- Philippines, Indonesia, Vietnam, Sri Lanka, Bangladesh, Pakistan, India, etc. If the governance culture in a country is poor, that is, very corrupt, then foreign aid won't help much, for the reason given at the opening paragraph. Someone suggested that it is not capitalism per se, but "industrialization driven by government direction... savings directed to industrial investments" that caused the development of Korea and other Asian “dragons”. But which poor country government that remains addicted to foreign aid is not doing that? Marcos did that, Suharto did that, the government of India, Pakistan, Bangladesh, etc. did that. So what do small entrepreneurs ask from government so that they can produce certain goods and services to society, so they can employ 1 or more workers in their shop? Nothing actually, except protection from robbers and extortionists, perhaps. So if VAT and income tax are enough to pay for government protection against extortionists and thieves, it is easier for them to pay. The problem is when government itself is the extortionist -- from a wayward policeman to city or municipal hall business permit section personnel to BIR guys. The bottom line for an economy's rapid economic growth is dynamic capitalism and the promulgation of the rule of law. Not more foreign aid, not more business permits and bureaucracies. When a country's law says "No stealing; Prosecution will be harsh", that's it. Governments should implement and promulgate it without exception to anyone, from the President down to the poor. Then people will have peace of mind to work even until midnight if they want, and go home past midnight, knowing that there are no robbers and extortionists to harass them and their family members in their house in a non-gated subdivision. Then there will be higher productivity and higher economic growth. In the case of the foreign aid bodies like WB, ADB, UN, IMF, USAID, etc., they perfectly know that there are robberies and stealing going on in many governments of poor countries where they are lending money to. Meaning there is breakdown of the rule of law. And yet they keep lending, year after year, decade after decade, today and a century from now. See Africa in particular, about $10 billion/year of foreign aid for the past 50+ years, and poverty and underdevelopment persists with impunity. About entrepreneurship, even from the ADB story of "creating an army of entrepreneurs" of ambulant vendors in Davao, it is safe to say that almost 100 percent of those micro-entrepreneurs that the ADB story proudly bannered, are informal. Meaning, they are not registered fully with a maze of government business registration requirements. From barangay clearance to municipal or city health and sanitation permit to Mayor’s permit to the BIR, DTI, SSS, etc. They maybe registered with the municipal or city hall but strictly speaking, they also need to register with the BIR and DTI. Single proprietorship like ambulant vending and “tiangge-tiangge” requires registration with DTI. Allow capitalism, free market capitalism, coupled with the promulgation of the rule of law by the government, to unleash people’s energy, which will hasten fast economic growth. Let the people put up all sorts of shops they think they can handle. If they make bad decision, they lose their money. Fine, they accept that bankruptcy is part of capitalism. If they succeed, fine, they expect that expansion is also part of capitalism. Government business bureaucracies -- and foreign aid loans -- should keep out. One or two business registration form and payment should be enough. Entrepreneurship and job creation is not a crime. Hence, it should not be penalized with a maze of business registration and compliance bureaucracies. "Actually joining FB and other social networking websites is actually not free...in exchange for the free use we are actually giving them our personal details which they can sell to companies or use to create new products...have you noticed the applications available in FB such as farmville? information we give in the net and patterns of use is also being used to profile us in creating new commodities. "its so unfortunate that we fell on the trap of voluntarily giving our personal details disguised as liberty. in the west not only companies benefit from our personal details but aso fraudsters and identity theives." Yes, no such thing as a free lunch. But I think people, me included, enter into this networking voluntarily, and can get out or unsubscribe anytime. As long as there is perceived net advantage (advantages are larger than disadvantages), people will stay. When an individual perceives there is net disadvantage, then it is time to get out. So there is fair game there. Compare that in government, even if our Mayor or Governor or Cong. or President is/are the most corrupt guys around, we still have to sustain them against our will. Zero voluntary arrangement there, unless one will become too radical and call for another "people power" revolution, local or national. "Free sites in the web have their own machination to entice people to join to achieve their motive. i remember ebay used to be free. once it got all the information of people buying and selling in its site it gradually introduce fees. now it is very expensive and people dont even realise it. they have been conditioned it's free and even introduced paypal as the only method people could use to pay in the guise that they are protecting the safety of their memebers. but sellers has to pay 10% to take the money buyer had paid out on top of the 10% commission ebay charges from the sale of the item. then there are fees for photos and other special features. "It is also very hard now for other businesses to compete with ebay as people have been hooked to ebay now." On "being hooked", I think it's the same with SM malls here all over the country. Food and shops at SM are not cheap, except when there are bargains, but people still flock to their malls with or without bargains. There are other big malls by big corporations that offer competition to SM malls. There is market competition. Between being hooked with something (ebay, facebook, SM, a cell phone brand, etc.) and not being hooked due to absence of stable or reliable competitors, many people choose the former. I think we should be thankful of capitalism. It depends on pure, voluntary exchange. Youtube, facebook, google, etc. go the extra mile to give excellent services at zero financial cost to us, and still they make big money somewhere. They get the money they wish for, we get the social networking we wish for. There are terms in joining the social networking, zero registration or joining fee, people accept it. Zero taxation and coercion, zero bureaucracies involved. A guy satirically commented, “thank you capitalism”. I know him, he’s a leader of an anti-globalization, anti-capitalism movement. And Michael Moore’s movie is indeed critical of capitalism. I think Moore is critical of big government capitalism (like Mr. Bush and Mr. Obama administrations), like the recent bail-out capitalism, and not really of competitive capitalism. Once competitive capitalism is severaly weakened, State capitalism aka socialism, will set in. But the break up of the former USSR, the fall of the Berlin Wall 2 decades ago, are proof that socialism is wrong. Let me briefly write about a good friend in the US, Ms. Jo Kwong, left in this photo, along with our 2 Japanese friends, Mr. You and Hiroshi. 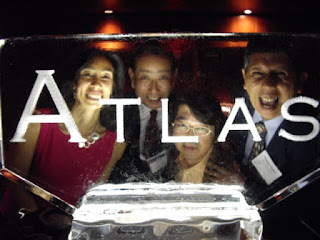 This was during the Atlas Liberty Forum in Atlanta, April 2008. Jo is the Vice President for Institute Relations of the Atlas Economic Research Foundation (www.atlasnetwork.org) in Washington, DC. Atlas is supporting free market think tanks and public policy institutes around the world with management tools, networking with fellow free market groups, prizes in competitive contests and nominations for various projects. I have known Jo Kwong in April 2004, when Atlas granted me an international fellowship to the US. It was my first exposure to other free market-oriented groups, think tanks and individuals from many parts of the world. Jo Kwong rocks. I used to call her the "superwoman of Asian liberty movement" as she was instrumental in starting the Asian Resource Bank Meeting (ARBM) and later the Asian Liberty Forum (ALF), in partnership with the Friedrich Naumann Foundation (FNF) in 2004 (HK), 2005 (Phuket), and 2006 (KL). Picture here taken in 2004 in HK, with Joe Lehman of Mackinac Center for Public Policy (Michigan) and Ugnius Trumpa of Lithuanian Free Market Institute. Atlas, however, discontinued the ALF in 2007 to start its new program then, the "Atlas Experience". It's good that the Americans for Tax Reforms (ATR), International Policy Network (IPN), Acton Institute, and Lion Rock Institute (LRI), started the Pacific Rim Policy Exchange that gathered free market think tank leaders and individuals from north and south America, with their counterparts across the pacific ocean. The Conferences were held in 2007 (Honolulu), 2008 (HK) and 2009 (Singapore). FNF of course has its annual EFN-Asia conferences, but they invite only their partners. Jo worked to bring some Asian free market leaders to attend some conferences and seminars of Atlas in the US through some travel grants. I personally thank her for giving me a few travel grants, like the Atlas Liberty Forum in Atlanta in 2008 and the Atlas Liberty Forum in Los Angeles in 2009. I personally know most leaders of Asian free market- and liberty-oriented think tanks and institutes -- from China, India, Pakistan, Japan, Mongolia, S. Korea, Hong Kong, Malaysia, etc. In fact I created and moderate a discussion list for us, along with a few friends from the US and Europe. A number of those uncompromising Asian leaders who champion individual liberty would attest how Jo Kwong has personally helped them and their think tanks in the Atlas network. Like Parth Shah of the Center for Civil Society, India (www.ccsindia.org) and Khalil Ahmad of Alternate Solutions Institute, Pakistan (www.asinstitute.org). Well, Jo is the highest offical in Atlas with Asian blood and looks. Although she was born in the US, her parents are from China and HK. I would admit that this is one reason why it's a lot easier for me to communicate with her, we are both Asians. And I guess our other Asian friends would feel the same way. In a few days though, Jo will be leaving Atlas where she has worked for the past 20 years. She will move to another free market NGO, the Philantrophy Roundtable (www.philantrophyroundtable.org). With her new office and work, I believe that Jo will still help old and new friends who fight for individual freedom, wherever they are in the globe. The income tax system in the Philippines is one classic example of the absence of the rule of law. The rule of law says that rules, laws, regulations and prohibitions apply to all people, no one is exempted and no one can grant an exemption. A quick look at how the law on income tax is being implemented would immediately show that it is one of the most hypocritical laws in the country. Many rich people do not pay the “correct” personal income tax of 32 percent top marginal rate. Among them are businessmen, professionals, corrupt government officials, those in the informal sector, and personnel and consultants of foreign aid bodies (UN, WB, ADB, IMF, USAID, etc.). The bulk of personal income tax collection by the government, especially the Bureau of Internal Revenue (BIR) comes from fixed-income earners. So if those who are supposed to pay are not paying and the burden of heavy taxation falls on the helpless workers who are subject to mandatory withholding tax, might as well abolish income tax system. Or drastically cut it to a rate that is not burdensome to the people, rich and poor alike, in order to reduce the level of hypocrisy and the extent of tax evasion. Taxes and government spending were among the major topics discussed by the 3 speakers on the panel, “Debt and Deficits” during the UP Academic Congress, Beyond 2010: Leadership for the Next Generation last Monday, February 1, at the UP College of Law, http://www.econ.upd.edu.ph/?p=906. The speakers were Professors Felipe Medalla of the UP School of Economics (UPSE) and former NEDA Director-General from 1998-2000; Prof. Benjamin Diokno of UPSE, former DBM Secretary in 1998-2000, and Prof. Leonor Briones of UP National College of Public Administration and Governance (UP NCPAG). The two former cabinet secretaries were suggesting that to avoid a fiscal crisis in the near future, revenues have to increase significantly, and one such measure is to raise the VAT from the current 12 percent to 15 percent, while reducing income tax from the current 32 percent (personal income) and 30 percent (corporate income) to 25 percent. I support the move to shift government revenues from income to consumption. As discussed above, many rich people do not pay income tax and the BIR cannot fully implement that law anyway. People hide their income as much as possible, while they flaunt their consumption: their new cellular phone, new computer, new shoes and clothes, new car and appliances, and so on. So if people voluntarily show off their consumption, even their profligacy, then collecting higher VAT would be easier. And with reduced income tax, fixed-income earners will have higher take-home pay, which means higher savings and/or higher consumption. What can greatly compensate for the initial revenue losses of the government as income tax rates (personal, corporate, others) decline, will be the entry of thousands of entrepreneurs and businessmen from abroad who want to escape their high-taxes regime in their home countries and are looking for low-tax economies to put up new businesses, or to transfer their existing businesses. Of total income tax collections by the BIR in 2008, personal income tax comprised 59 percent of total BIR collections; VAT comprised 22 percent, and other taxes 19 percent. An earlier panel also on February 1 lecture, was a session on “Jobs and the Cost of Doing Business in the Philippines.” The speakers were Dr. Cielito Habito from the Economics Department of the Ateneo de Manila University and former NEDA chief from 1992-98, and Dr. Cayetano Paderanga of UPSE, former NEDA chief before Dr. Habito. I noted during the open forum, that one major reason why there are not enough jobs in the country and the cost of doing business is high, is because there are many planners in the government, both at the national and local government units. Planners tend to create distortions in the incentives and disincentives system in society because it is simply impossible to predict how people would behave if certain regulations and restrictions were put in place by the government. Thus, to remedy the situation, we might consider abolishing a number of planning agencies in the government, like NEDA and the Department of Agriculture (DA), for socio-economic and agriculture planning, respectively. Consider the food sector. There is no government carinderia, no government restaurant, no government supermarket, and yet people are eating. There are no central planners suggesting or dictating how many thousands of pizza and hamburger, or how many kilos of “sisig” and “kaldereta”, to be produced everyday across the country at what price, at what servings and topping, and so on. Product differentiation and market segmentation allow food producers and sellers to target certain group of consumers and consumers do the same to the various food producers and sellers. The two speakers were hesitant of course, to support my proposal to abolish, or at least drastically reduce the size and functions of those bureaucracies. What was important for me was to articulate the perspective of less government intervention to allow more competition in the market, to allow personal, parental and community responsibility in running their own lives. Reforms in both taxation policies and government spending are necessary to combat the endemic corruption in Philippine public administration and to discipline, if not discourage, unwarranted expansion in the size and power of the various bureaucracies that tend to restrict individual freedom. After the 3rd MeTA Forum last Jan. 26-27, we have a forum for our local coalition, Coalition for Health Advocacy and Transparency (CHAT) last Jan. 28, also at Diamond Hotel. I jokingly told some friends and other NGO leaders there that one of my personal advocacies is not cheaper medicines but "boycott medicines". This is somehow an offshoot of MG philosophy, "Healthcare is first and foremost personal and parental responsibility." Why? The full year 2009 and last month, or 13 months straight, I have not been taking any medicine -- no vitamins, no food supplement, no anti-biotics, etc. For me, the best medicines are good food, nutritious food. And not abusing one's body. I drink, about 2 to 3 times a month. Mostly light drinking, but sometimes heavy drinking with heavy head and hang-over the next day :-). But I don't smoke. Me: Doc, is drinking not allowed while I take the anti-biotics drug? Me: But I got an invite for a belated reunion with some friends tonight, with lots of food and beer! Dr. You choose, ridding your cough quick or your beer. After leaving the HMO office, I said I will just buy the drug tomorrow and I will choose good food and beer tonight. I just drank lots of water and juice, and beer that night. The next day, before going to the drugstore to buy the anti-biotics, I got a text message from another friend, "Please be there on my birthday party!" That's just 2 days from now, and I know that this friend of mine always gives slam-dunkin birthday bash, with unlimited food, unlimited drinks (beer, wine, high-octane drinks, etc.). So I said, I will postpone buying the drugs for another 2 days. Meanwhile, I continued the "water therapy" -- lots of water, juice, other liquid. It's discomforting sometimes to be going to the toilet so often to pee, but that's the result if one drinks lots of water too often. So enjoyed the night during my friend's birthday party. Super-enjoyed that I got a bad hang-over the next day. But surprisingly, my "water therapy" was working well. Although I had a hang-over that day, my cough was getting weaker. A few days more of lots of water intake, the cough was gone! Lesson? I did not buy the essential drugs not because I don't have the money, but because I chose beer on those 2 occasions in a span of 4 days that I was advised by my doctor to take anti-biotics! But seriously, the best medicines are good food, nutritious food, and not abusing one's body with over-drinking, over-smoking, over-eating, over-fighting, over-sitting in sedentary lifestyle, etc. When real diseases come in, say hypertension or cancer or other serious diseases, that's the time to buy prescription drugs. By then, one has a somehow healthy body and some savings to buy the necessary medication. And don't forget, the physician's fee and diagnostic tests, if one does not have a private health insurance.